Jack in the Box makes some wonderful mini sirloin burgers, but they also serve up mini buffalo chicken sandwiches. These are easy to make, and perfect for a party, a tailgate celebration, or even any night for dinner. Be sure to use Frank’s Red Hot Sauce to make these sandwiches spicy, Frank’s Red Hot sauce is what Jack in the Box uses, and it is one of be best hot sauces around. 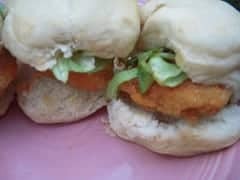 Make your own mini buffalo chicken sandwiches just like Jack in the Box with this copycat recipe. Prepare the chicken nuggets as directed on the package. Cook the heat and serve rolls until done. You will want to use 1 chicken nugget for each roll. Split open the rolls, on the bottom bun coat with buttermilk ranch dressing, and then put the chicken nugget down on the bottom bun. Add about 1 teaspoon of Frank's Red Hot sauce to the top of the chicken nugget and then top with iceberg lettuce and the top bun. I love that you used the chicken nuggets this made it so easy to throw together for the kids. What a great quick snack to feed the kids when they get home.